TAMPA, FL -- (MARKET WIRE) -- August 15, 2005 -- On September 7, 2005 at 4 pm EDT, Alexander Rosemurgy, MD, FACS, Professor of Surgery at the University of South Florida and a surgeon at Tampa General Hospital, will present live over the internet a Laparoscopic Nissen Fundoplication. This procedure is an excellent long-term treatment option for acid reflux, commonly referred to as 'heartburn.' Michael Albrink, MD, FACS, Associate Professor of Surgery at the University of South Florida and a surgeon at Tampa General Hospital, will narrate the procedure. With the patient under general anesthesia, surgeons use 5 half-inch incisions to enter the abdomen through cannulas (narrow tube-like instruments). The laparoscope, which has a tiny video camera, is inserted through a small incision allowing the surgeon to view the patient's internal organs on a TV screen. During the procedure the stomach is configured to form a ring around the esophagus -- similar to the placement of a napkin ring -- which will function as a valve between the esophagus and the stomach. Prior to the development of this laparoscopic procedure, surgeons had to make a large abdominal incision and recovery time was extensive. The Laparoscopic Nissen Fundoplication reduces recovery time and in the vast majority of cases eliminates the need for acid reflux medication. The Surgical Digestive Disorders and Gastrointestinal Cancers Program at Tampa General Hospital recently received disease-specific certification from the Joint Commission on Accreditation of Healthcare Organizations (JCAHO). Dr. Rosemurgy, Director of the University of South Florida Division of General Surgery, Director of the TGH Surgical Digestive Disorders Center, and The Vivian Clark Reeves / Joy McCann Culverhouse Endowed Chair for Digestive Disorders and Pancreatic Cancer, maintains a full surgical practice, is fully engaged in teaching and administration at both the USF and TGH and has ongoing basic science and clinical research interests. His research focus includes achalasia, portal hypertension, GERD, cholangiocarcinoma, and pancreatic cancer. 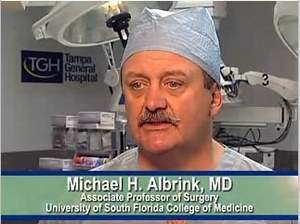 Dr. Albrink, Associate Professor of Surgery at the University of South Florida, likewise manages a busy surgical practice with teaching and administrative responsibilities at both USF and TGH. His practice and clinical research interests include critical care, advanced laparoscopic surgery, GI surgery and anti-reflux surgery. See a live Laparoscopic Nissen Fundoplication Surgery<br>for the Treatment of Acid Reflux, commonly known as<br>heartburn, from Tampa General Hospital.